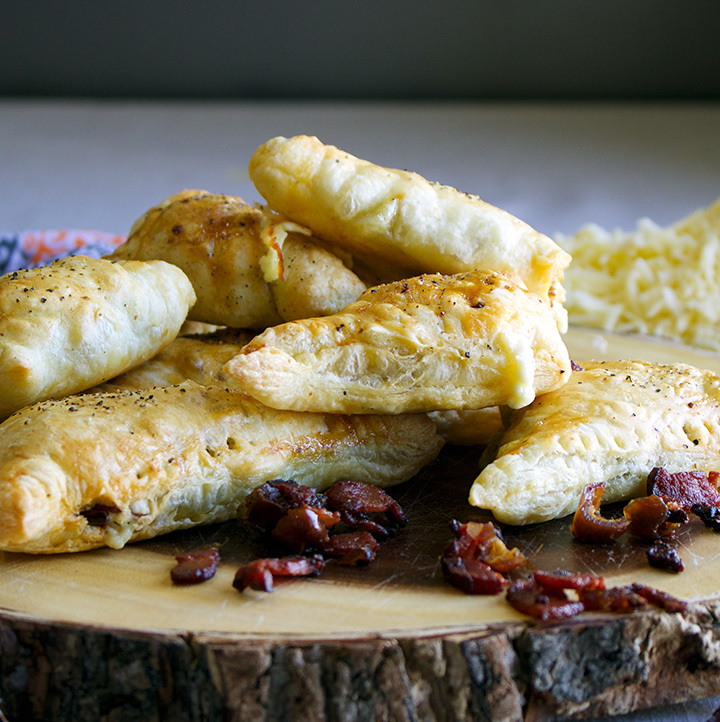 Cheese, Bacon, Date, and Chipotle Pepper Turnovers. 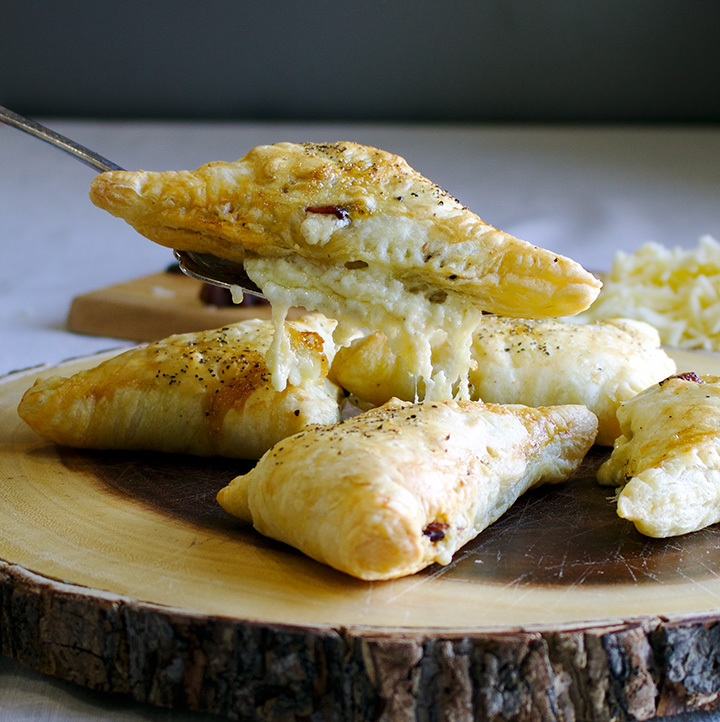 These savory puff pastry turnovers are stuffed to bursting with three delicious cheeses, crispy bacon, spicy chipotle peppers, and sweet dates. 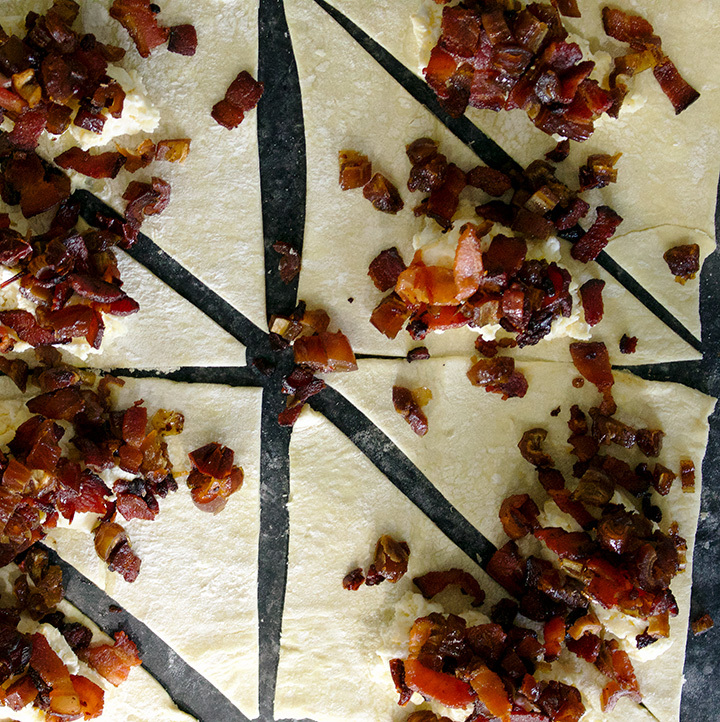 If you’re having a party anytime soon, you’re going to want to make these. If you’re not having a party anytime soon, you’re still going to want to make these. Not having party might even be your best option because, well, more for you. 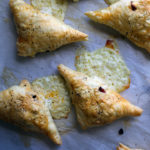 And, while these make the perfect party food (they are small, can be eaten with your hands, and are delicious enough to make your guests think you are a mad genius) they are also the kind of thing you might be tempted to make on a night when all you want to do is eat good food while lounging in front of the television. These savory little turnovers start with one of the greatest culinary marvels of the modern grocery store freezer case: frozen puff pastry. If this stuff didn’t exist, neither would this recipe, because ain’t nobody got time for homemade puff pastry. Let it thaw, then cut it into triangles. 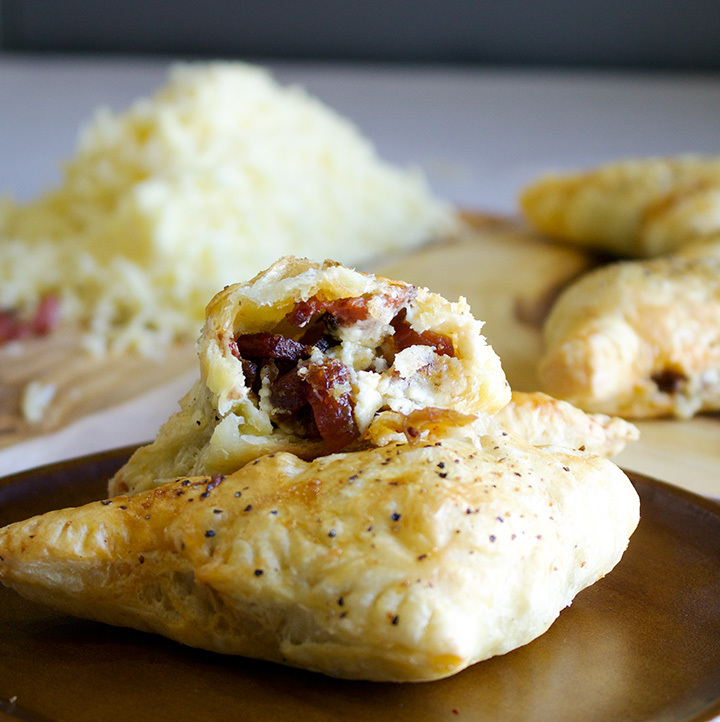 Fill the triangles with a generous amount of of cheese, bacon, chipotle peppers, and dates. When I say “generous amount”, I really mean it. You want to fill these babies with as much filling as you can get in there and still be able to pinch them closed. Fold the triangle edges together, press with the tongs of a fork, brush with a little egg white and sprinkle of black pepper. Bake. Devour. See all that melty cheese in the pictures below? These are best served warm, so when feeding a crowd, cover them with foil and pop them in a 200 degree oven until ready to serve. Set the puff pastry out on the counter to thaw. *Follow the recommended thawing time on the package instructions, which should be around 40 minutes. You want the pastry to be cold, but malleable. Heat olive or vegetable oil in a large skillet over medium heat. Add the bacon and cook, stirring frequently, until crisp. While the bacon cooks, remove 3 chipotle peppers from a can of chipotle in adobo sauce. Scrape the seeds from the peppers and dice. Dice the dates. Set a colander over a bowl, scrape the cooked bacon into the colander, and allow the bacon to drain for a couple of minutes. Do not rinse out the pan – you want a thin film of bacon fat across the bottom of the pan. Put the bacon back in the pan along with the diced chipotle peppers and dates. Set the pan back over medium heat. Cook, stirring constantly, for 3 minutes. Scrape the mixture into a bowl and let cool to room temperature while you prepare the cheese and pastry. Add the grated cheese, cream cheese, salt, and 1/4 tsp black pepper to a bowl and stir to mix. Preheat the oven to 375 degrees and line two baking sheets with parchment paper. Add the egg white to a small bowl and add 1 tsp cold water. Whisk with a fork for 10-15 seconds. Set aside. Lay one sheet of puff pastry on a clean work surface that’s been lightly dusted with flour. Roll out the sheet to a 12-inch square (approximately). Cut the sheet into 4 squares. Then, cut each square diagonally into triangles, so that you have a total of 8 triangles. 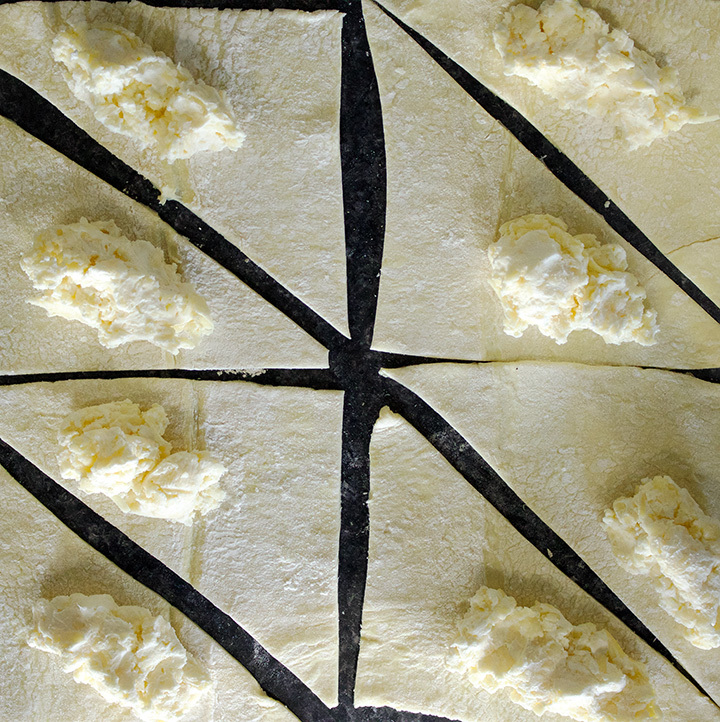 Add a generous tablespoon of the cheese mixture to one side of a puff pastry triangle, and spread it out slightly. Top with a generous tablespoon or two of the bacon-date mixture. Brush the edges with egg white and fold the pastry up and over the filling, stretching it as you do so that the filling is completely covered. Press down the edges slightly to seal. Use a spatula to lift the triangle onto the parchment covered baking sheet. Press the tongs of a fork around the edges of the triangle to seal the dough completely. Repeat with the remaining triangles. 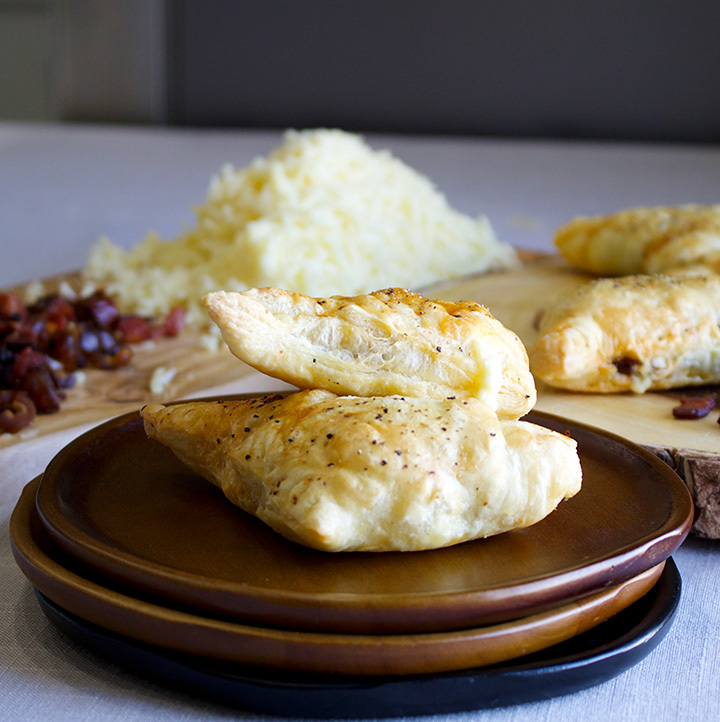 Brush the tops of the turnovers with egg white and sprinkle with a bit of ground black pepper. 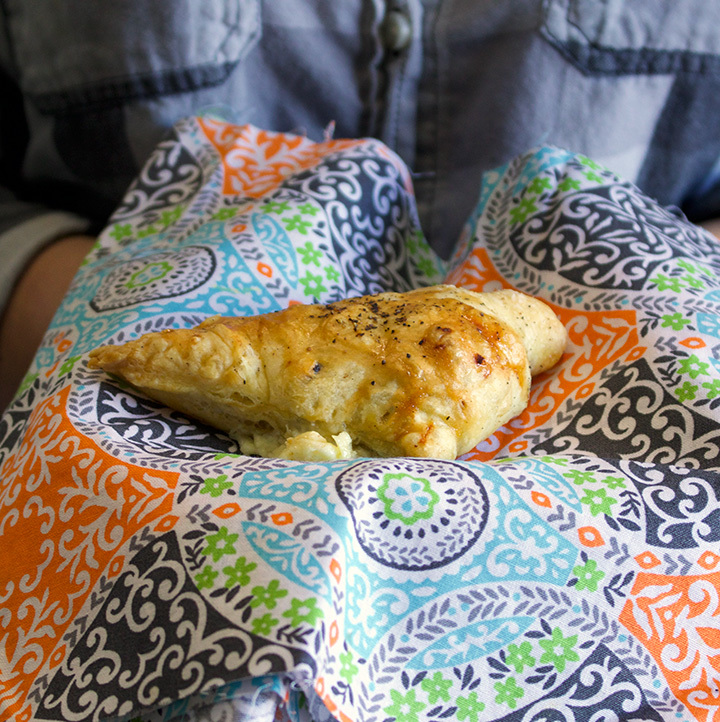 Serve soon after baking, or cover with foil and keep warm in a 200 degree oven.